Hi, I am one of the curriculum developers at Codesters. I wanted to share a talk that I gave at PyGotham 2015. PyGotham is New York City’s own Python language conference. It was an exciting opportunity to become better at programming and to participate in the thriving Python community. 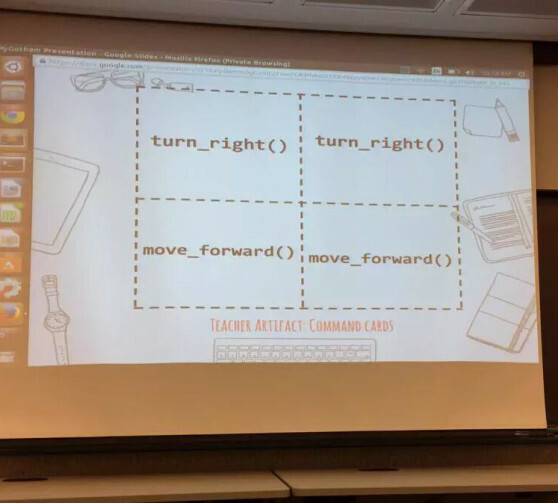 This talk covers the why and the how of teaching text-based coding, particularly Python at the Middle School level. It draws on my experience teaching in mixed-ability classrooms, some of my work as a graduate student, and some of our curriculum features at Codesters. People who use and contribute to Python are dedicated to giving back through education and the development of open-source resources; so the talk was well received. My talk was during the first session of the first day of the conference and it opened up a discussion that was ongoing on twitter and in between sessions. Several of the attendees I spoke with volunteer their time to contribute to open-source education projects or work for local Girls Who Code programs in addition to their jobs as developers. I also spoke with two dedicated teachers from The Young Women’s Leadership School of Astoria and the Bronx Academy for Software Engineering. Other speakers continued the conversation on and off the stage. Keynote speaker, Jessica McKellar, discussed the importance of Python as an education language at all levels. Nick Coghlan, also a keynote speaker, talked about making open source projects successful including those dedicated to education. At Codesters we are excited to participate in active programming and education communities. If you want to get involved or know of people or organizations we should be aware of, tweet at us @icodeinschool. You can also tweet me directly @teach_python.